Discreetly beavering away on the north-west coast of England since 2010, gradually refining a distinctive amalgam of extreme, melodic, aggressive sounds and exploratory concepts, Necronautical have travelled a long way. 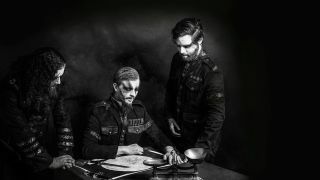 Formed as a lo-fi recording project by a trio of bored mates named after an in-joke, they now stand poised to release their spellbinding second album, The Endurance At Night, on legendary reactivated label Cacophonous, ready to assert themselves live in earnest and claim their place among the cream of the burgeoning British black metal scene. In this sort of music there’s often a fine line between the sublime and the ridiculous. “That’s the line we endeavour to walk!” laughs Naut. Surprisingly often, oceanically inclined metal artists live a long way from their beloved briny. Heidelburg’s ‘nautical doom’ quartet Ahab are 300 miles from the North Sea, while Mastodon wrote Leviathan a similar distance from their nearest seaport. For Necronautical, sea winds are closer to home.